Boil pasta of choice according to package directions or al dente. Cut the anchovies into ½-inch pieces and combine them with their oil in a large glass bowl. 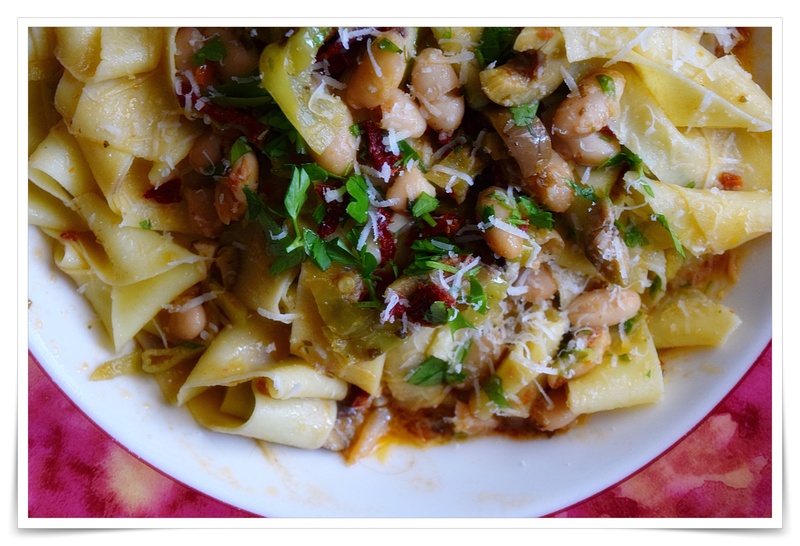 Mix in the garlic, beans, olives, peperoncini, tomatoes, parsley, and salt. Heat in a microwave oven for 1 ½ to 2 minutes, until warm. Scoop out 1 cup of the pasta cooking liquid and add it to the ingredients in the bowl. Add the cheese and mix well. Drain the pasta and add it to the bowl. Mix well and serve immediately on warmed plates, with more cheese, if desired. Pépin, Jacques (2015-10-06). Jacques Pépin Heart & Soul in the Kitchen (Kindle Locations 3453-3466). Houghton Mifflin Harcourt. Kindle Edition.